A well presented ‘Assisted Living’ retirement 1 bedroom 3rd floor flat built for the over 70’s by McCarthy & Stone. 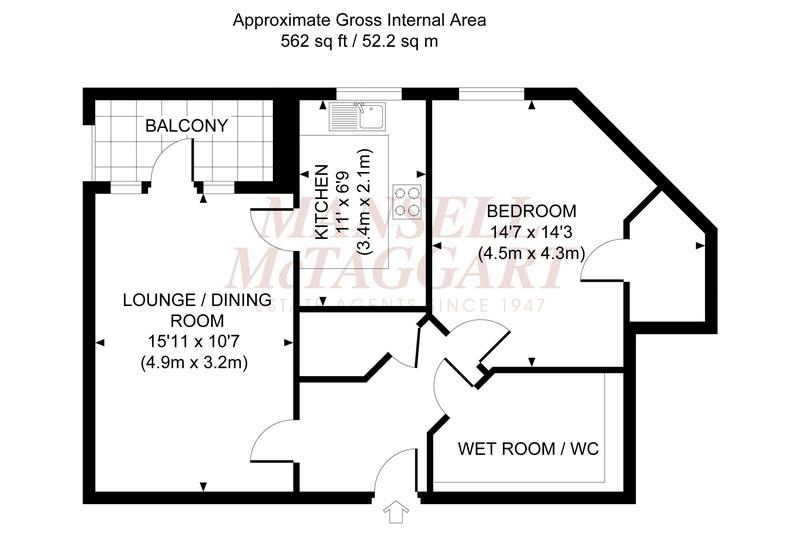 The apartment features a good size balcony which can be accessed via the lounge/dining room. The town centre, mainline railway station and Waitrose Store are all within a short walk. Corbett Court is an exclusive assisted living development which offers 24hr staff on site and full security systems. There is a residents lounge with an array of social activities, a restaurant serving a 2 course lunch with a choice of menu and evening suppers. The block has a guest suite for visiting family and friends, communal laundry and one hour of domestic care per week. There are 2 lifts, car park, scooter charging rooms and beautifully arranged communal gardens. The accommodation includes a communal hallway with sliding doors, entry phone system and reception desk. A lift/stairs lead to the 3rd floor. The private entrance hall has a large airing cupboard and the lounge/dining room has direct access to the balcony. The kitchen is well fitted complimented by an integrated hob, oven and fridge/freezer. The master bedroom benefits from a walk-in wardrobe. The wetroom/wc is a particularly generous size with fully tiled walls and floor. Outside, there are communal gardens laid to paving with colourful borders divided by hedging and ornamental trees. Ample bench seating, raised fishpond. There is a car park to the rear of the block which requires a permit. A fabulous one bedroom flat with no ongoing chain. Burgess Hill is surrounded by picturesque countryside and historic landmarks; offering plenty of local amenities; with great connections via road, rail and air. The town centre offers a variety of shops, cafés and restaurants; there is a local cinema, playgrounds and parkland, sporting facilities including the popular Triangle Leisure Centre and clubs for anything from bowls to yoga. For families looking to move, Burgess Hill is an ideal choice with good schools, plenty of outside space and activities to keep families of all ages entertained. Well Connected There is so much within easy reach, from the city of Brighton, to historical Lewes, to the far reaching South Downs. Easy access to London and Brighton ensures family days out are popular and commuters are well catered for. There are frequent trains from Wivelsfield and Burgess Hill to London Gatwick, London Victoria, London Bridge, London St Pancras International and Brighton and it is just a short drive to access the A23 at Hickstead, from which it is a short drive to Brighton or north to Pease Pottage to pick up the M23 for the M25. Stations: Burgess Hill Mainline Railway Station (London Victoria/London Bridge approximately 54 mins and Brighton 20 mins) 0.4 mile. Situated in this prestigious over 70’s retirement block within a moments walk of all amenities.